Plate from 'Thomas and Sally or, the Sailor's Return. 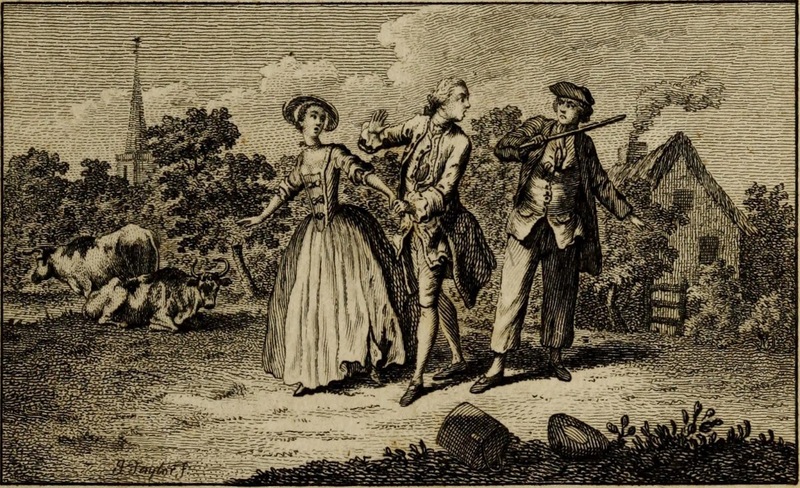 A musical entertainment in two acts and in verse,' author Isaac Bickerstaffe, artist unknown, 1770, Internet Archive. Drawn from the script for the comic opera "Thomas and Sally," this is an unusual entry into the "sailor's return" trope. Most works in this vein have a happy reunion, and often involve the sailor displaying the wealth he has made on the sea. Instead, Thomas has returned from a long sea voyage to rescue Sally from the seductions of the evil squire. "Thomas and Sally" was a popular short opera, one that is commemorated in other works as well. You can hear the play in what I believe is its entirety here. Jack threatens with the stick in his right hand, reaching back with his left. 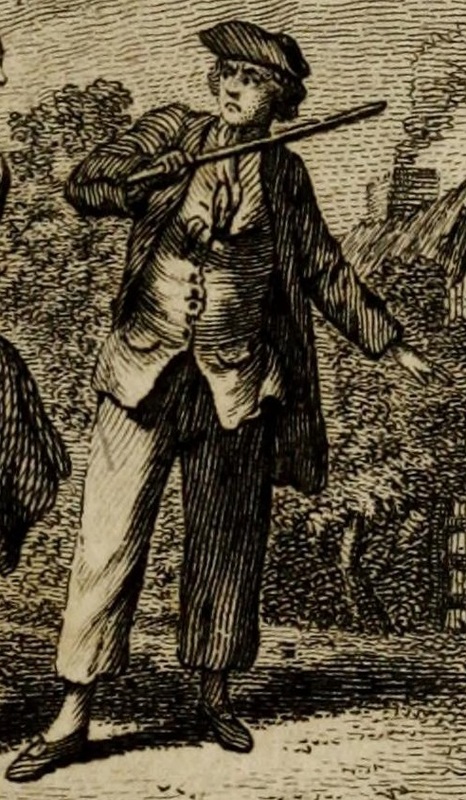 Atop his head is a reversed cocked hat over what appears to be a bob wig, and at his neck is a light neckcloth tucked into his single breasted waistcoat with its waist pockets. One of the interesting details of this piece is that the ends of the neckcloth poke out through an open buttonhole at his chest. His jacket is somewhat long, ending about mid-thigh. His trousers end well above the ankle, revealing his white stockings. Rounded toe shoes with oval buckles round out his slop clothes.